From my family to yours…. I thinking last night about all I do for my kids. And then I realized that I wear a lot of mom hats: soccer mom hat, tennis mom hat, Girl Scout mom hat, ballet mom hat, swim mom hat and most important of all since without wearing this one I can’t do all of the above: taxi mom hat. I don’t think I would be able to any of this if I didn’t drive. The funny thing about driving is that I didn’t get a license until I was 25. I went to Driver’s Ed in high school but I was a nervous driver. I didn’t practice anywhere else but there. My father only took me once in beast of the van (which he still has twenty plus years later) and that was it. My brothers didn’t bother to take me out either. So obviously, I did not pass the driving portion of the class. I really did not need a license anyway. I was still in high school so the bus was it. Once I went to college, I also took the bus. I didn’t go anywhere but school and home. I really didn’t have social life outside those two places. If I wanted to go anywhere else, it was on the bus. I did have some friends who had a car and on occasion I would get a ride from them but that was not very often. When you live in a large city, public transportation was the easiest solution. Then I got married and I still didn’t have a license. Eric didn’t have one either but he decided to make it happen. He drove and passed his test. We bought a car soon after that. And yet, I still didn’t have a license. I did get a learner’s permit because I wanted to be comfortable driving. I drove until the permit expired and I drove even after it expired. Finally, we were driving by a DMV in Schaumburg. Eric drove me right up to the place so I can finally bite the bullet. Another funny story: so I was my turn to take the driver’s test. It was a hot and very sunny day. The tester wanted to check to make sure my lights were working. I had to put my left blinker on and then the right one. Like I said, it was a very sunny day. She couldn’t see the lights blinking. I finally put the flashers on. As she was approaching the car, I heard her say “Are you stupid or something?” I don’t think she meant for me to hear her (or maybe she did???) but it made me nervous and probably made me feel like I was in high school again. I did tell her about it but I can’t remember what her reaction was or what she said. It just felt wrong especially since I was taking this test for the first time ever. I guess she was satisfied with the blinker situation and told me to start the car. I was finally doing it: DRIVING!!! I went thru the motions: drive forward, three quarter turn, reverse, merge, etc. Now my worse driving skill is perpendicular parking. It still is but I’ve gotten better. Now the coolest thing about taking the test out in the suburbs is they don’t do the perpendicular parking, they do diagonal parking instead. Best thing ever. I finally finished the test and we walked back into the office. I told Eric about what happen. He went to complain about the lady. The manager, I think, came over and apologized. Needless to say, I passed the test and got myself my very own driver license. Any way, this was supposed to be about wearing hats and driving everywhere for my kids. Just like my life, it is just all over the place. And you know what? I wouldn’t change it for the world. Hope you have a wonderful Christmas and New Year from all of us. 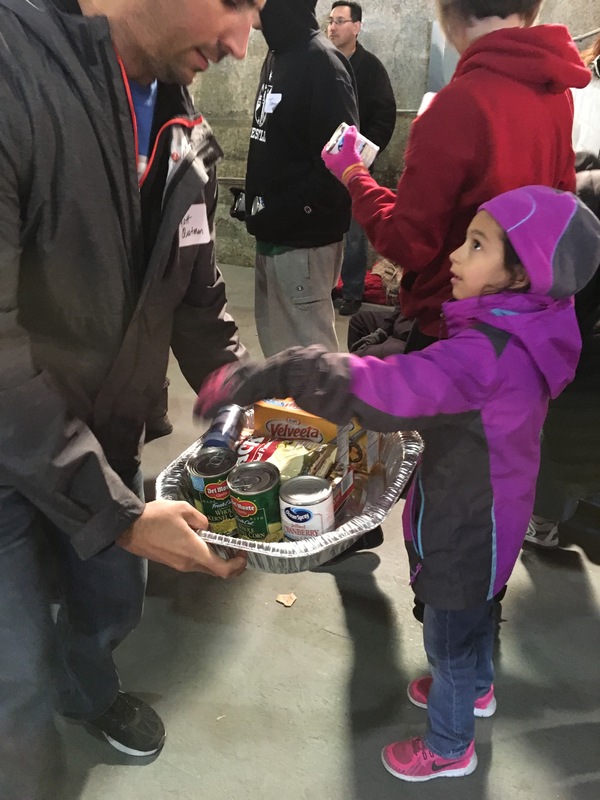 This morning Mia, myself and a few hundred folks assembled food baskets for disadvantaged families for thanksgiving thru Chicago Basket Brigade. Three of Mia’s girl scout daisies and their families came along for the ride. It was a wonderful experience. There was DJ who spun music. The ladies that were also passing out the biscuits were having fun and making our group very lively. Mia was dancing, singing and just having a good time that she didn’t complain about the work she was doing. 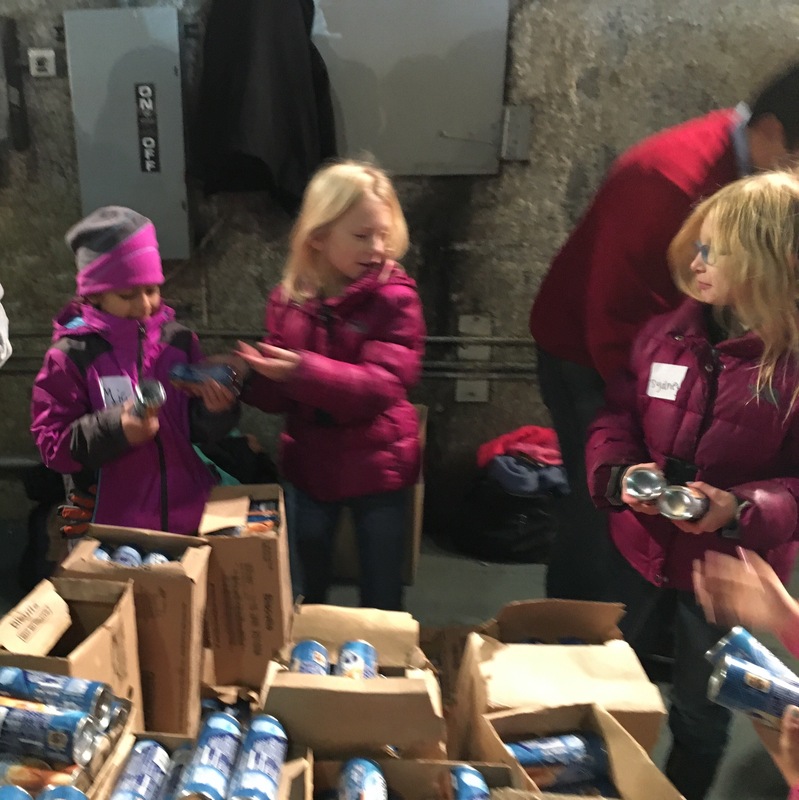 “Don’t drop the biscuits!” was a gentle reminder to be nice to the cans. 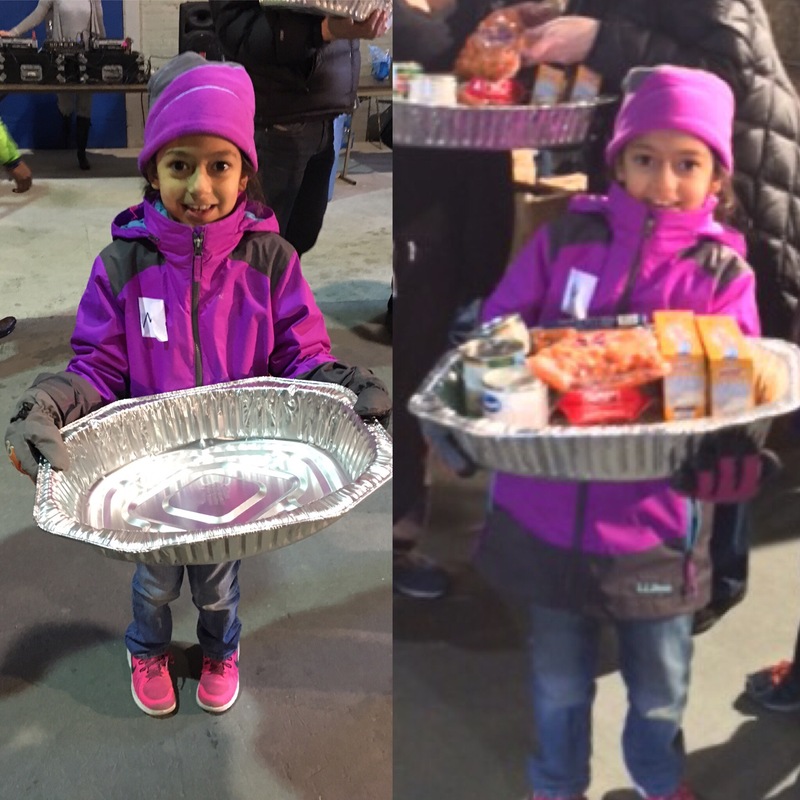 It was heavy by the end (there was jello, gravy packets, a pie and a bag of salad added after the second picture was taken) but she managed to get the bundle to the table with help from another volunteer. I had my own and couldn’t quite help her. We then went back to the biscuit area and she started to put the cans in the trays. 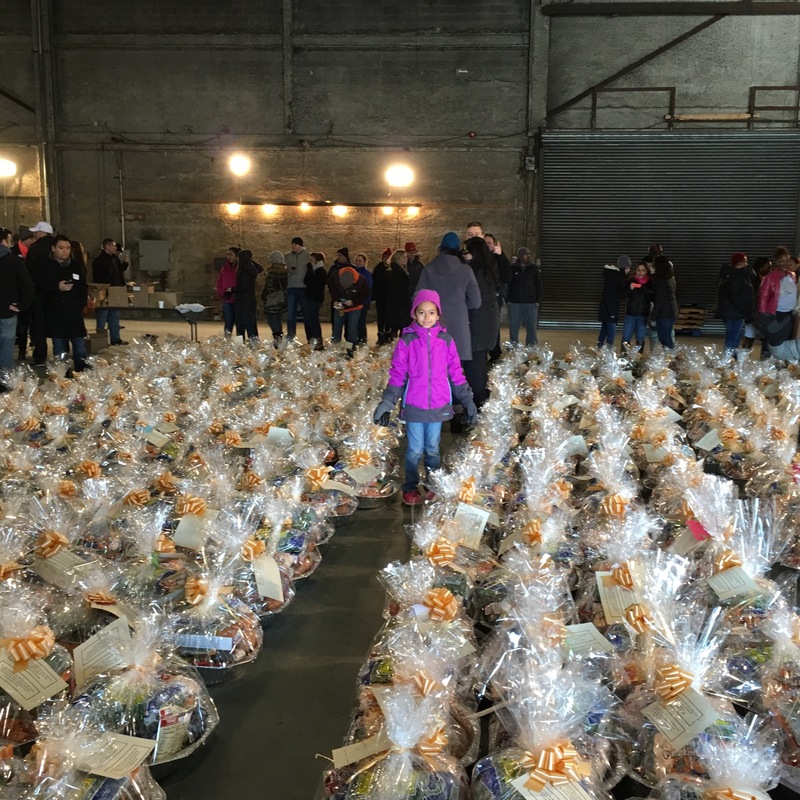 At the end of it all, there was enough food to assemble 1500 baskets. I hope my little girl understands that we can’t save the whole world but we can do our part by doing good deeds like this. I hope we do this again next year. She is such a big girl now. 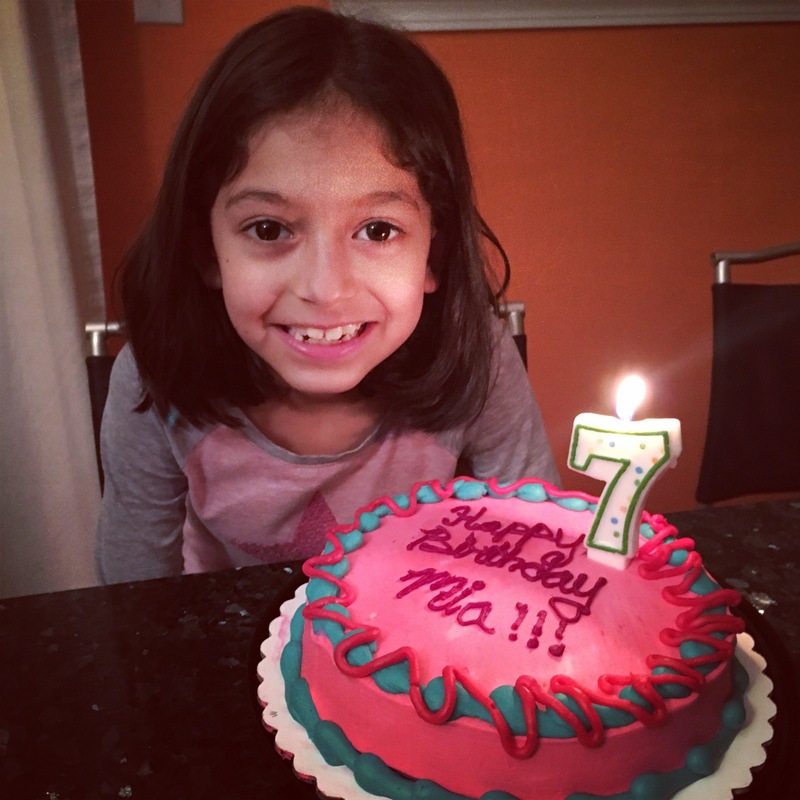 She can ride a bike, almost swim, is in 1st grade, lost all here front teeth, she’s 48 in tall. Love my girl. Halloween is tomorrow. Mia is going to be Ana from Frozen. I was trying to discourage Frozen anything but I will be the fourth year of Frozen mania so I succumbed. Plus the costume was 25% off at the Disney Store and I can’t resist a sale. Diego is going to be a ninja. He loves it because he can cover his face and be a true ninja (plus he has some nun chucks). Mia is still a Daisy. She loves it. Always looks forward to the meetings. And I am willing participant. I am the birthday mom this year. The gift is a tote bag painted with the daisy flower and personalized with their name and troop number. It takes about three days (about 8 hrs total time) to paint each one. Plus they get some hair ties that I had made last year but never got around to giving the out and a birthday month patch. It’s lots of work but I know Mia loves it. Diego is still playing soccer. He is playing for the Chicago Magic PSG since February of this year. He had lost some spark playing with Chicago Fire. We had been talking about finding a new team for a couple of months and we knew of a couple of kids that had moved to Magic as well and were happy. Once we made the change, it was like the spark reignited for Diego. So so so happy we made the move. I’m sure there is more but I’ll stop now. I’ll try to post a Halloween picture tomorrow. Please cross fingers that it won’t rain.